Mystery E-book deals (Perry ) – Joyce's mystery and fiction book reviews with some non-fiction too! Those of you who read my blog already know that I love Anne Perry’s historical mystery series. Thanks to NetGalley, I am currently reading Dark Tide Rising, the newest Monk title. The book comes out in September. I can already tell you that it is very good, raising many issues about love and loyalty. But…in the meanwhile these two Anne Perry novels are currently out as bargains. Discover a very enjoyable series or add to your collection. Inspector Thomas Pitt, Anne Perry’s gentle and astute hero of eight other Victorian mysteries, assumes a secondary role in this complex, gripping and highly satisfying mystery. High officials in the Foreign Office wish to reopen the unsolved murder case of one of their diplomats, Robert York, and Pitt is reluctantly chosen by Supt. Ballarat, his arrogant and ambitious superior, to head the investigation. Ballarat is fearful of offending powerful friends, so he cautions Pitt to be thoroughly discreet, thus rendering him ineffectual. Charlotte, Pitt’s able wife, decides to aid him by exploring the upper levels of society that are closed to a police inspector. Skillfully assuming the role of a country girl with breeding and money, she befriends key figures in the York murder: Veronica, the stunning yet fragile widow, and Loretta, York’s steely and self-contained mother. 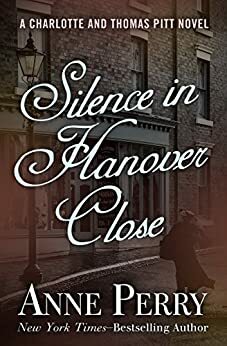 Emily, Charlotte’s titled and wealthy sister, carries the investigation a step further by hiring on as Veronica’s ladies’ maid, where, her real identity unknown, she is able to eavesdrop on both upstairs and downstairs gossip. The mystery is an adroit blend of thick London atmosphere and a convincing cast, mingled with the complex and straitlaced conventions of Victorian England. A bonus is a totally surprising yet wonderfully plausible finale. When Charlotte Pitt, well-born wife of Thomas Pitt, the police investigator, learned of her mother’s distress in losing a locket with a compromising picture, she did not know it was the beginning of several bizarre events that would end in sudden death. 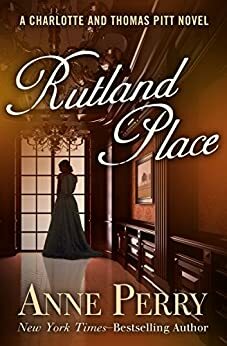 For hidden behind the sumptuous elegance of Ruthland Place were terrible secrets. Secrets so horrifying that only murder could conceal them. And only the dogged persistence of Charlotte and Thomas could reveal them….